For as long as professional football is played, there is something in the life story of the utterly eccentric Ernie Hunt which can surely NEVER be matched. It’s highly unusual, bordering on unique, that the first four games he played for Wolverhampton Wanderers were all 3-0 League victories. But what distinguishes him from John Holsgrove, who was introduced to the side for the same quartet of games in the autumn of 1965, is the result of the first match after he moved north from Swindon – a 9-3 humiliation at Southampton! “I don’t think any player anywhere can have started at a club like I did,” Hunt said. “I remember going to The Dell the day after joining Wolves, sitting on the sidelines and wondering what I’d let myself in for. “Then we go out and have great wins in the next four games, as we were inclined to do with having such good attacking players. In the run of four wins, Bury and Middlesbrough were put to the sword at Molineux while Norwich and Leyton Orient were picked off on Wolves’ travels. 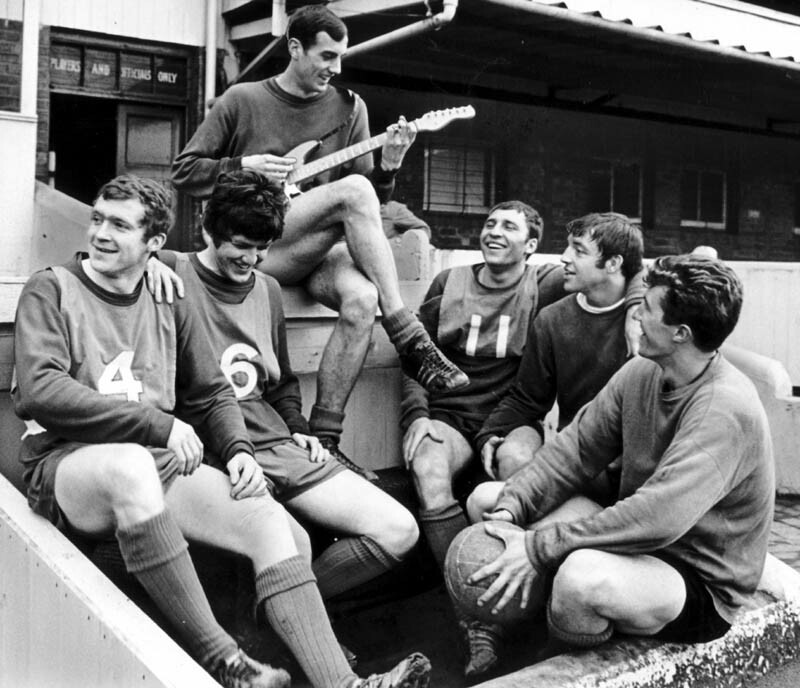 A musical interlude for (from left) Terry Wharton, Peter Knowles, guitarist John Holsgrove, Mike Bailey, Ernie Hunt and Fred Daves. The club’s first season outside the top flight for 34 years nevertheless ended in the disappontment of a final placing of sixth. But Hunt had dropped a hint of what was to come by scoring ten times in the League and adding an FA Cup brace against Altrincham. 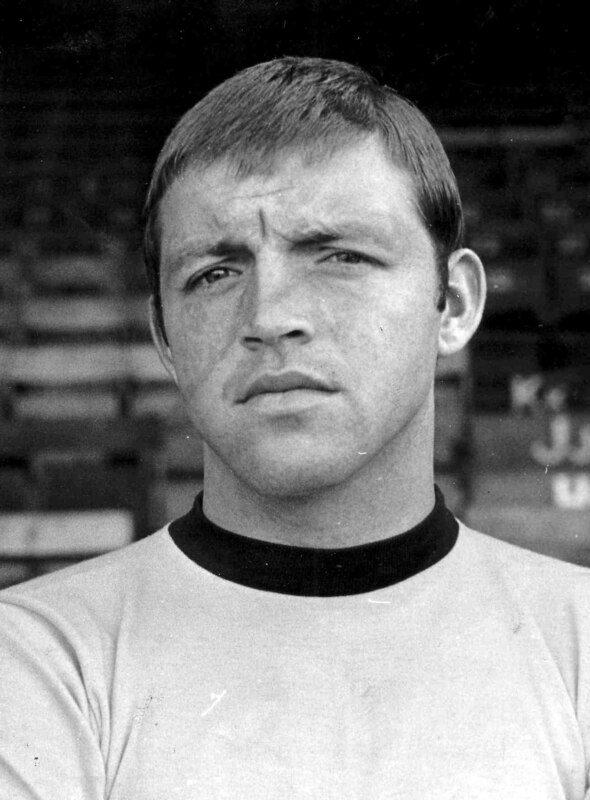 And he led the Wanderers charts with 21 goals in 1966-67 – the season they won promotion – including a late-October hat-trick at Northampton. No sooner had he scored at Tottenham the following September, though, than he was on the move again in a career that would later take him via Everton to Coventry, Doncaster and Bristol City. “I didn’t really want to go and never settled at Everton but Wolves paid £40,000 for me and got £80,000 back, so they obviously wanted to see the profit,” he added. * He was born on St Patrick’s Day, 1943, and consequently christened Roger ‘Patrick’ Hunt. * He became known as ‘Ernie’ to differentiate between he and Liverpool’s World Cup hero Roger Hunt. * He once ran a restaurant in Birmingham with team-mate Mike Bailey. * He had a sports shop in Coventry, then a pub in Ledbury for ten years. * He had a window cleaning round in Stroud that he had to scrap after falling off a ladder and breaking eight ribs. * He rings Phil Parkes about every three weeks and always puts on a different voice. * In recent years, a book called Joker In The Pack was written about his career. * His weight ballooned with ‘too much drinking and too much eating’ to 17st but he’s now down again below 12st. * He and his wife keep two dogs, five cats, a budgie and two rats. YES, two rats. “It’s like a bloody zoo here,” he smiles. Introvert and dull in his retirement, Ernie Hunt certainly isn’t. 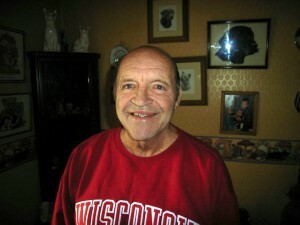 Posted on: Saturday, March 28th, 2009.